In 1846, Sir Anton Lavrin, the Austrian general consul in Egypt, gave to what was then the Museum of the Province of Carniola in Ljubljana an Egyptian mummy in a painted wooden anthropomorphic coffin. Today this is the only Ancient Egyptian anthropomorphic coffin with a human mummy in Slovenia. The hieroglyphs on the coffin were translated in 1866 by Albert Kosmač, the first Slovenia Orientalist. It was evident from them that the mummified Isahta had been a priest in the temple of Amon at Karnak, and that he lived in the turbulent late period of the 25th or 26th dynasty (7th - 6th cent. BC). The coffin and mummy were fully conserved and restored in 2000-2002, and many investigations were also performed then. 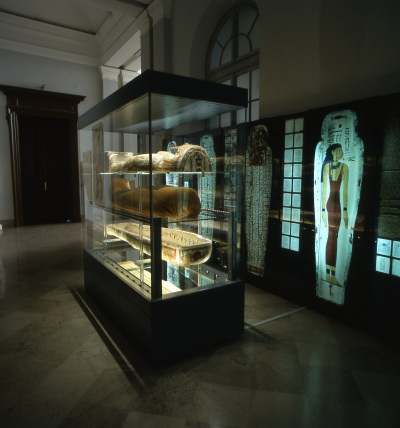 The coffin and the mummy are presented to the public together with several other artifacts from Ancient Egypt in the ground floor hallway of the museum, along with the results of the primarily non-destructive examinations. A brief film presents information about the lengthy conservation, restoration, and investigation of the coffin and mummy. An interesting educational program also parallels the exhibit.